"According to the National Association for the Specialty Food Trade, in 2010 specialty food will account for $50.3 billion in sales through stores, and another $12.7 billion through restaurants - accounting 13.1 percent of all food sales." I think the artisan food career program we've created at the Innovation Kitchen is an amazing way for people to experiment in food entrepreneurship. You have a recipe. We make it for you, package it, label it, store it and ship it. You get to start an artisan food enterprise in a growing $63 billion per year space. The size of the market this study identifies is significant. This is a great time to experiment, to launch an encore career, to launch a great new food innovation, to make some jobs. As a plug for Iowa County, Mineral Point and the Wisconsin Innovation Kitchen, if you utilize the Innovation Kitchen as your co-packer (we make it / package it for you), visiting Mineral Point becomes a business trip. See a great article about Mineral Point in the Chicago Tribune below. The Wisconsin Innovation Kitchen is proving to be a valuable experiment in expanding the opportunities in local foods and regional food systems. Having the Specialty Foods trade association measure the business at $63 billion per year is a real eye opener. How to Bring a Food Product to Market. Inc. Magazine. October 28, 2010. Written by Gina Pace. Chicago Tribune article about Mineral Point. By William Hageman. November 7, 2010. Photo is of Jeremy Lynch, of Enos Farms. 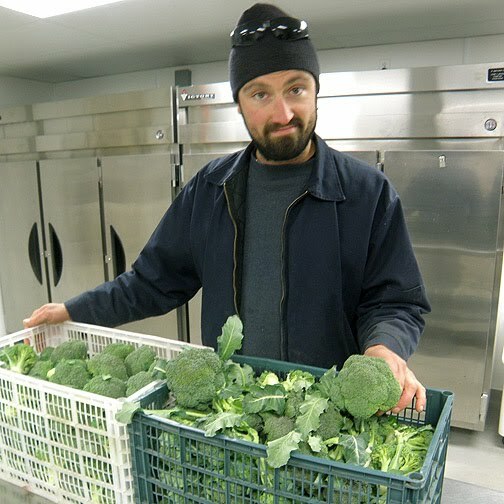 At the Wisconsin Innovation Kitchen we refer to Jeremy as our 'Farmer in Residence'. His culinary skills and his food lines are amazing! Our family LOVES Jeremy's Parsnip Black Pepper Crackers. Jeremy farms near Frank Lloyd Wright's Taliesen in wonderful Wyoming Township, Iowa County, Wisconsin.